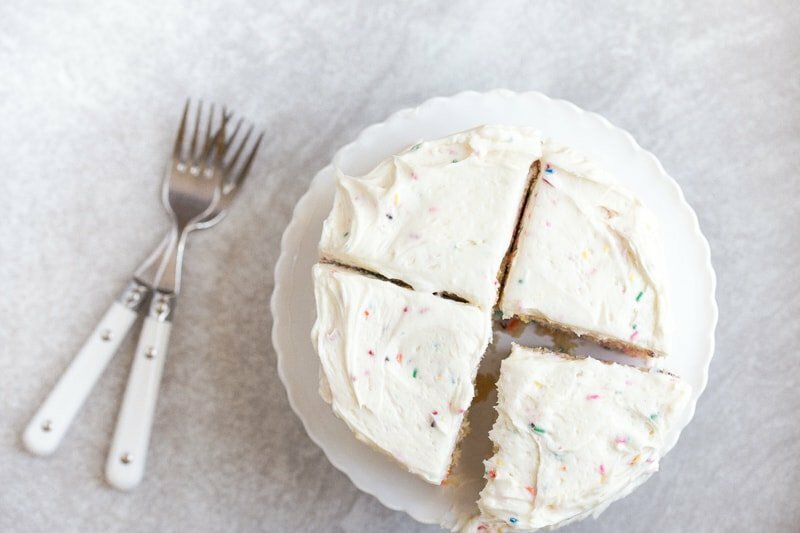 Homemade funfetti cake recipe for two. Small sprinkles cake for two. If ever there was a cake that I could eat all by myself, this is it. Homemade funfetti cake for two. I mean, sure, my chocolate fudge cake was eaten in a span of 4 hours, but I had help on that one. And this cinnamon red hot apple mini cake that the world forgot about was taken down by one fork, mostly. 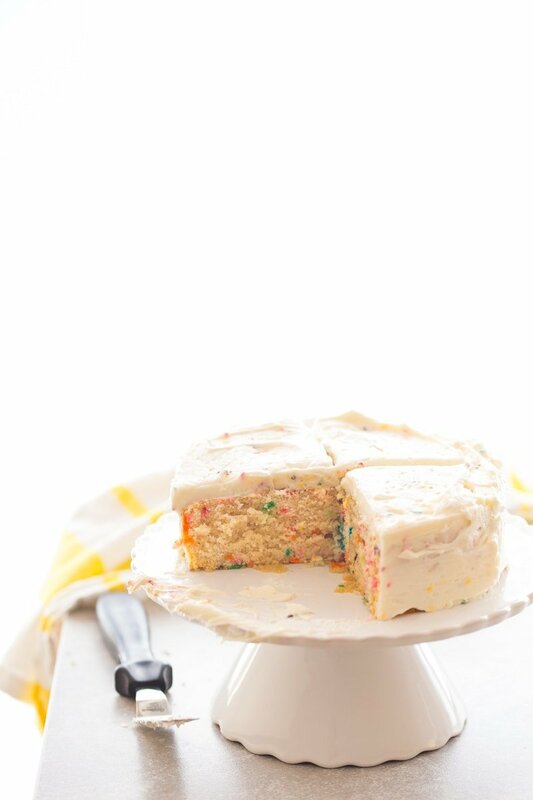 But this homemade funfetti cake. This cake could have been all mine. If I didn’t have a husband who was supposed to be at the driving range until late, it could have happened. I somehow miscalculated, and thought he’d be home later than usual. I thought I would have more time alone with the sprinkles. Like lovers driven apart, we are. When I posted my little guide to the 3 pans you need for small batch baking, my 6″ round cake pan was the most talked about. You guys love my mini cakes! That makes me so happy, friends! I love mini cakes, too! I mean, we all love cake, but we all don’t have 4 sticks of spare butter and 4 hours to make a normal 3-layer cake, ya know? Making mini cakes is a great way to get a little bite of cake in your day, everyday, with minimal effort! Whenever I make a normal-sized cake, I have to set aside an entire afternoon to do it. My mini cakes, however, can be baked up during nap time! Even on days when a baby that normally takes two 2-hour naps a day is suddenly, randomly, and inexplicably taking 40-minute naps ONLY. I mean, I’m not bitter about it or anything, and that’s definitely not me googling all about 11-month sleep regression patterns. Ugh. Do you see that little finger swipe in the frosting in the upper left most piece of cake? The baby who stopped taking long naps did it. I frosted it while she watched. Every time the camera beeped, she stared to watch the photo preview pop up. It was kinda cute. She was being extra cute, and I kinda felt bad for not letting her have any cake. But, she’s been on this earth just barely longer than she was in my belly. She has a whole lifetime to eat cake. I, however, only have so many years left, so I better eat this whole cake right now. Please leave me be with my lover, k? Thanks, bye. 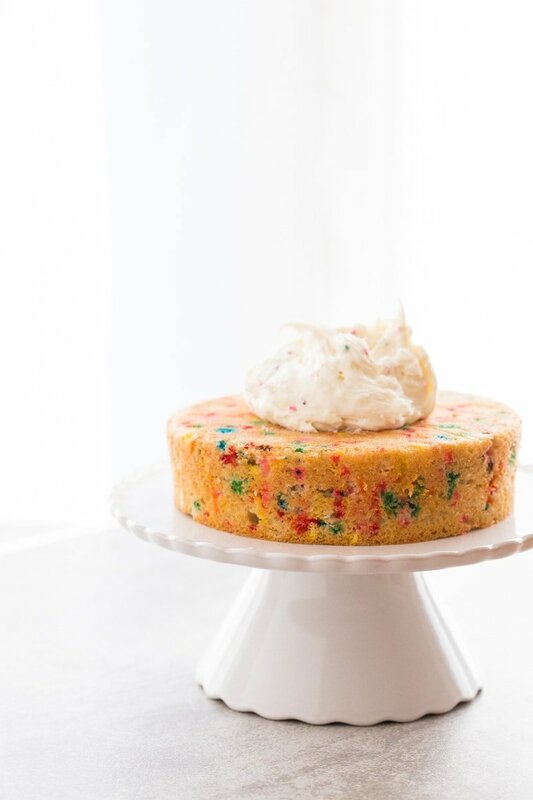 Mini funfetti cake for two as a small birthday cake! First, preheat the oven to 350. Spray a mini 6" cake pan that has 2" high sides with cooking spray. Line the bottom of the pan with parchment paper (trace it on a piece of parchment paper, cut it out, and fit it in). Next, beat together the butter and sugar with an electric mixer until light and fluffy, about 1-2 minutes. Add the vanilla and egg white and beat until well-mixed. Add the flour, baking powder, and salt and beat for just a few seconds to combine it, and then add all of the milk. Beat until smooth, but do not over mix. 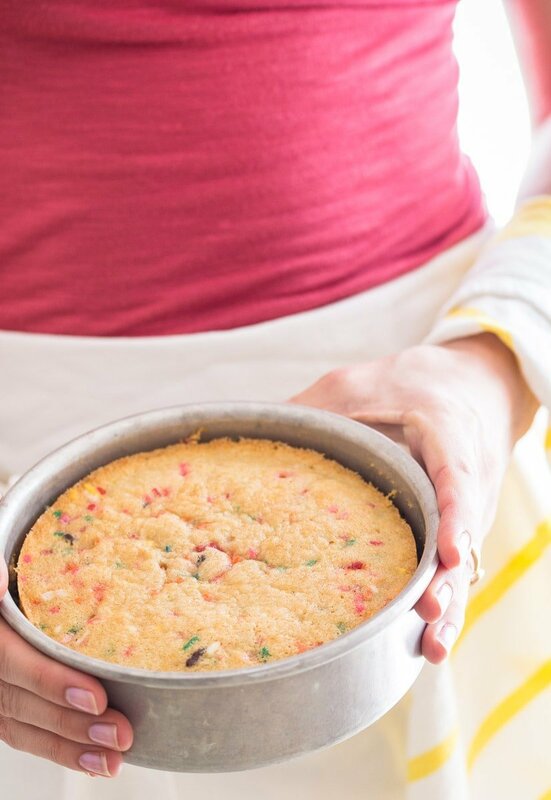 Pour the cake batter into the prepared pan, and place it on a baking sheet. Bake for 30 minutes, or until a toothpick inserted comes out with only moist crumbs clinging to it. Let the cake cool slightly before gently tipping it onto a plate--it should come out easily. Peel the parchment paper off the top of the cake. Meanwhile, beat together all of the frosting ingredients, except the sprinkles. Stir in the sprinkles last. Frost the cake, slice and serve. What’s the measurements of ingredients ? Scroll down to the recipe. How adorable!! I love white cake with chocolate frosting, so I will be making this little cutie with that minor change ! I love your little cakes and make them often! I have three, and by the time my husband comes home, there is just enough for him for desert! I think it’s fair, don’t you? But my very favorite cake in the whole wide world is white cake! Like wedding white? Do you have a recipe for that? OMGosh, I’d be SO grateful if you did! Three pieces! I have three pieces. Sorry! I totally think that’s fair!! As far as he knows, the recipe only makes 2 pieces LOL! I agree! White cake is the best! But funfetti is right up there! Making this today!! So cute! 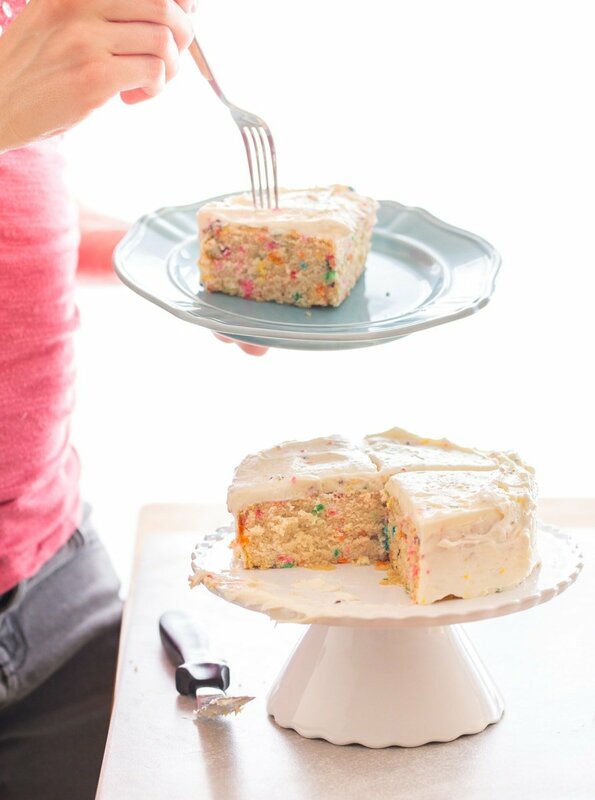 I have never had funfetti…it is still crunchy after it bakes in the cake or does it soften? Yowza! I have another stove on order so I can follow your bliss. You are an excellent writer, flavoring it with your Texasisms. Keep it up dear girl, and drive friendly, hear? Y’all stay well! This is such a cute cake! Sprinkles forever and ever, amen. What an adorable post, in every way. I love funfetti. Who doesn’t? Since I am now an empty nester, I’m wanting to downsize my cakes. I love cake. I love white cake. I am so excited to use my 6″pan (I do a lot of pressure cooking, and these come in handy for that). I can’t wait to make this! Do you put the 6″ pan inside your pressure cooker? I’m intrigued! I love all your little cakes, with just my husband and I and our 1 year old, we don’t really need full sized cakes. :) These are just the perfect size for us, and so yummy! Good luck on the sleep regressions, they definitely aren’t easy, and seem to happen just when you’re getting back to a regular schedule! Just made this! Mine didn’t seem to rise very much. Maybe my baking powder is old? Any other suggestions? Mine didn’t rise much either, any troubleshooting tips? Love this little cake. I get bored when I make a 3 level cake and takes me to the next day to get it frosted. But w e love cake and your minis are perfect. I have 2 4 inch pans with 2 inch sides (springform). Do you think this would be enough batter and frosting for 2 4 inch cakes? Need to make 2 for my son’s 3rd birthday (joint party with another little boy) so hoping this will work! Hi Rupa! I have not tested the recipe that way. I have no idea how it would work. Generally changing pan sizes isn’t a good thing. I would test it before the big day so you don’t have two very unhappy little boys! This is pretty much exactly what I have been looking for! I’m sitting here eating a slice of this AMAZING cake and planning to make your “1st Birthday” cake in just two months (gasp!) for my daughter. She has yet to enjoy sugar, but tried to steal a piece of a brownie I was eating a few days ago. I loved reading your blog last year while I was pregnant, and have made your double chocolate chip cookies dozens of times. Thank you, thank you! I needed a small cake for my coworker’s birthday, next week. Funfetti is her favorite. My search is over, very grateful to have found this and I LOVE the 6″ pans! She loved the cake – made it today. But she didn’t share ???? So guess I have to make it again! Have you ever tried this recipe for cupcakes? If so how long do you cook it? I haven’t, but others have in the comment section and said it worked great! I also baked them as 6 cupcakes at the same temp for about 19 minutes and they came out well. Thank you for letting us know! I’m just about to bake them as cupcakes and see how they turn out! :) Did they sink? I only have a 7″ round pan. Can I bake in that? I don’t recommend it, I’m sorry. The cake won’t bake properly. You can try it, but watch the cake in the oven! sooo story time. there are 4 of us in our little family: 10 months, 4 years old (today),myself, and my husband (who doesn’t eat cake as of yesterday…. what??? ). the above mentioned 4 years old wanted a “tall fetti cake” for her birthday…what???. what’s a girl to do, right? i took this glorious recipe, divided it among a 6 muffin top pan and baked those pretties for 15 minutes. let them cool, made some icing, layered them up (only 4 high), iced it, loaded it with sprinkles, and voila! mini “tall fetti cake” for two. bless you and your little cake too. I recently moved away from family with my husband. I wanted to make myself a birthday cake but I had initially decided against it — we honestly didn’t NEED a regular sized bundt cake to ourselves (I will guiltily admit that I would have eaten more than half). Thankfully, I found this recipe the day before my birthday (it finally occurred to me to look for small cake recipes). I ran out and bought two 6 inch cake pans for a two layer version. It seemed to have baked up well. While it was good, the cake seemed just a bit dry and the frosting was super sweet. Thank you for introducing me to small batch baking, though! I am in love with your recipe index and fully intend on trying many more of your dessert recipes. This is creative. So fun and festive! Just made this cake and have a second one in the oven and it looks nothing like the photo. I made sure I had fresh baking powder and this may be an inch high and the sprinkles really bled and therefore the color at the bottom is dark. May have to try the donut ooey gooey in the morning as a substitute. I’ve had a couple of 6″ pans for years and haven’t used them very often. Not because I never wanted to. Recipes for pans that size are hard to come by so I’m thrilled to find this and your blog. I’m looking forward to trying it for a tea party with my daughters this week. I made this cake yesterday with my 6 year old grand daughter. We had so much fun, she loved using the hand held mixer I purchased after ordering your Dessert for Two cookbook. She likes to pretend we have our own cooking show. She added some whole strawberries to the top after frosting. Do you know what could be subbed to make this dairy free? My daughter has a milk allergy. Thanks! I haven’t tried this recipe without milk, but I’m guessing soy milk would work? just made it and my husband loves it although minus the sprinkles as he prefers it plain. it did not rise as much as yours too but the taste is relish. i read in one of your comments that the 3″ height of a 6″ pan may cause the cake not to rise much. Oven temp is same as yours although my baking powder may be one yr old. No worries i am doing it again and hope it works better now with a 6″ pan of 2″ height. wish me luck. Made this today, tasted great and was so fun to make. Only issue was that my cake didn’t rise like the one above or that I thought it should. Was kind of thin after it cooled, it was little high in the middle. Will definitely try again. I actually used a rectangular cake pan for this, 6 by to inches if I’m not mistaken, and it rose even more than in the picture, hope it works the same for you! Wow it looks amazing and I really want to make it but only have 7″ , 8″ and 9″ pans. Can u pls advise on how to alter the ingredients so it can fit in one of those? Also the baking time and temp pleeeaassse!!!! Hi Mo, no, unfortunately, you really need the right size pan or the recipe won’t work. I only test my recipes in the size pans you see listed. I’m not sure how to scale them for each individual pan. Sorry. Is this for 6’x 2″ cake tin? One Tin?? Yep. Use the 6×2″ tin to make this recipe, as pictured. Made this with my 4 year old son, he loved mixing this together and adding the sprinkles! It tasted delicious!! Will definitely make again. Hi Christina, I was wondering if I can use cake flour instead of all purpose. Aslo if I eliminate the salt can I then use salted butter? so lately I’m really into baking and I’ve tried getting this cake just right, but I can’t ? The confetti never gives my cake small rainbow spots but makes it blue-greenish as if I used food colouring ? Which kind of sprinkles did you use for the cake in the picture? Hello! I wanted to make 3 layers of this cake, do I triple the ingredients? It’s not dense. It’s good, trust me. :) Tons of people have commented on instagram that they’ve made it, and I’ve received lots of emails. Check through the 75 comments here; I’m sure more than a few people made it :) My photography skills are not doing this cake justice. I made this cake in a mini bundt pan with enough for one cupcake and it was delicious. The mini bundt cake I gave as a gift and my husband and I split the cupcake. I didn’t have white sugar so I used light brown sugar instead and it was moist and sweet and i am definitely going to make this again. Thank you!! I always see “do not overmix” once flour is added, however, can you please tell me exactly what amount of time does that mean: “beat until smooth but do not overmix”? Is it a minute or two, or just a few seconds ? Thank you. Great question, Steph! It means stir until all of the flour is incorporated and you don’t see streaks of flour anymore. But once that happens, stop mixing. It should take a minute or so. This turned out like a charm! I have been struggling to find a good funfetti cake recipe that turnout! Love that this is a small cake, since it’s just me…lol. Also, I had purposefully bought the 6″Fat Daddio’s pan for this recipe! It worked like a dream! Thank you for sharing this recipe and I’ll definitely be back for more! This is the best cake recipe that I have tried ever. thanks for sharing this such a beautiful and delicious recipe. I’m planning on making this for my friends birthday but I’m not sure if I’ll have time later in the week. Ho long can this cake be stored and still be good? two days covered in the fridge? Let come to room temperature before serving. I adore your mini cakes. I love cake but it’s hard and super time consuming to make a normal size cake. Plus, my family is small. 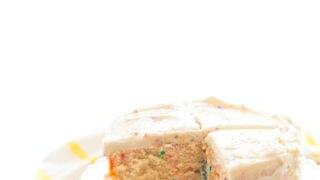 I am looking very forward to make your funfetti cake for new year celebration. Excited to try it! I love funfetti and got a strong craving for it tonight. Found this and it was perfect! It was just right for our family of 4. I will definitely make this again! Just made this again and the bottom stuck…did I not wait long enough to let it cool? I also didn’t have parchment paper, could that make it stick? Hi I’m just wondering the “ 1 large egg white” do I only put the egg whites or just use a white egg? Just the white of 1 egg. Save the egg yolk for another recipe. Made this cake exactly as recipe! Perfect! Thanks for awesome recipe! Will be making this again!